Trulia: How Did The Election Impact The American Dream? 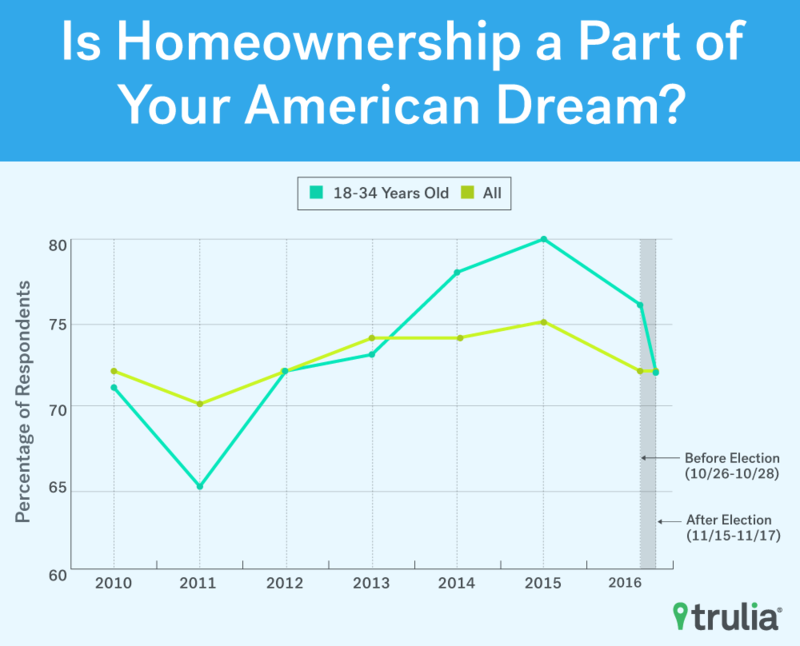 For the first time in five years, fewer Americans than last year said homeownership is part of their American dream, noted Trulia in its latest survey. 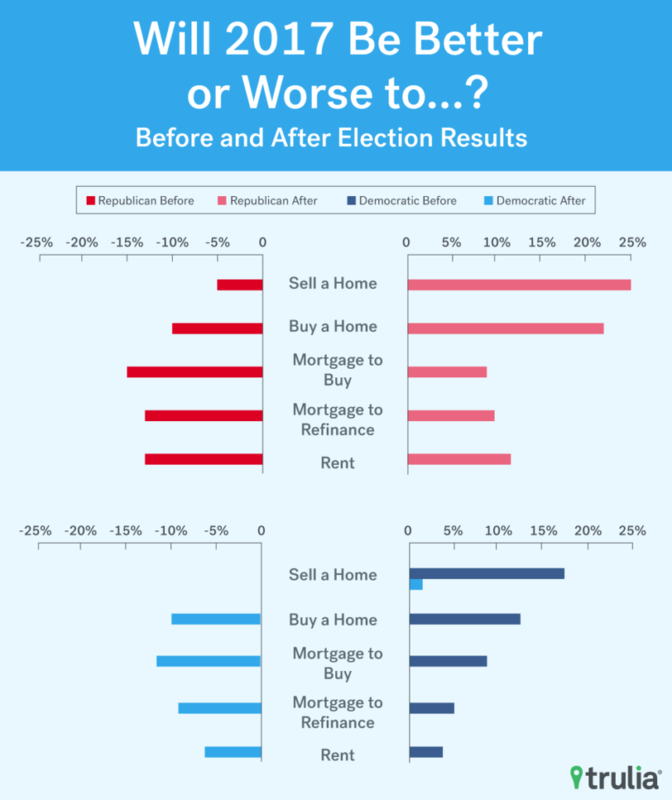 Post-election, Democrats are feeling pessimistic about the 2017 housing market, while Republicans are feeling more optimistic. In addition to political worries, survey respondents were worried about saving for a down payment (59 percent), poor credit (38 percent) and rising home prices (35 percent). In September, National Association of Realtors (NAR) Chief Economist Lawrence Yun painted a somber picture of the U.S. housing market in the NAR August existing-home sales report. “While recent data from the U.S. Census Bureau shows that household incomes rose strongly last year, home prices are still outpacing incomes in many metro areas because of the persistent shortage of new and existing homes for sale,” Yun said. According to Trulia’s latest study, it seems that Yun’s prediction might come to fruition due to the issues mentioned above, along with wavering belief in the “American Dream” of homeownership. “For the first time in five years, fewer Americans are telling us that homeownership is part of their American Dream, dropping to 72 percent this year from 75 percent last year,” says the study. This is especially true when it comes to millennials — 72 percent believe in the dream of homeownership, an 8 percentage point drop from 2015. So, what’s the cause of the dreams deferred? In Trulia’s pre-election survey, when Hillary Clinton had a solid lead on Donald Trump, Republicans reported feeling “pessimistic” about the 2017 housing market, and anticipated the market would take a turn for the worse. Fast forward to the post-election survey, and Republicans were feeling much better about the upcoming year. “Republicans went from having a -9 point margin for buying a home in 2017 to a +17 point margin, a swing of +26 points, while shifting from a -5 point margin on selling a home to a +25 point margin, a swing of +30 points,” Trulia noted. Meanwhile, Democrats are reeling from a completely unexpected election loss. In the pre-election survey, Dems were bullish about the housing market and were the most optimistic about selling a home in 2017 with a margin of +17 points. Now that Trump’s full transition into the presidency is a little over a month away, Democrats are preparing for what they expect to be a hard four years. The only thing Democrats still feel optimistic about is selling a home. 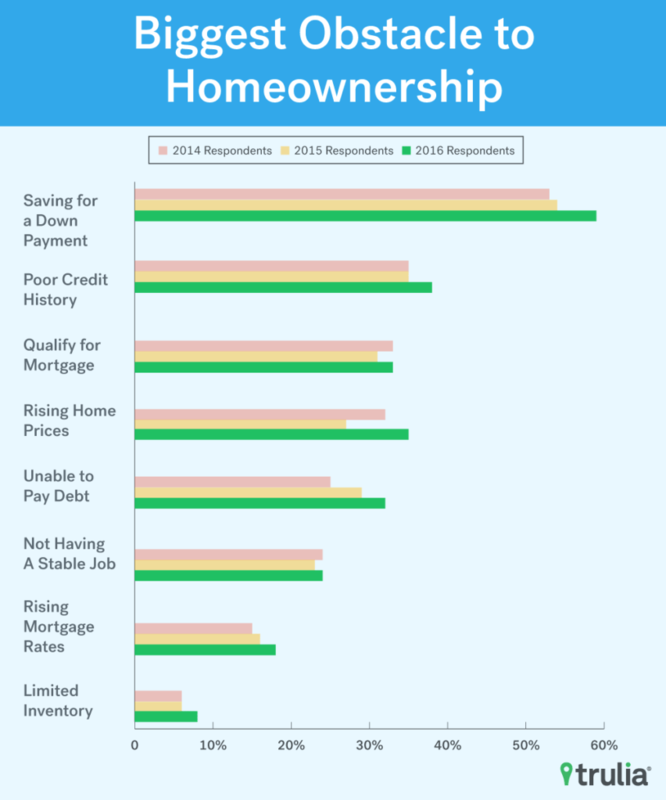 Besides the election, respondents said saving for a down payment (59 percent), poor credit (38 percent) and rising home prices (35 percent) are the biggest challenges in their journey to homeownership. Survey-takers weren’t too worried about rising mortgage rates (18 percent) or limited inventory (8 percent). The survey respondents had self-selected to participate in Trulia’s surveys, so the results can’t necessarily be extrapolated to the general population due to the selective sample. The 2016 surveys were conducted online within the United States between Oct. 26 and 28 among 2,007 adults (aged 18 and older) and again on Nov. 15 and 17 among 2,081 adults by Harris Poll on behalf of Trulia. The 2015 survey was conducted online within the United States between November 19 and 23 among 2,016 adults by Harris Poll on behalf of Trulia.